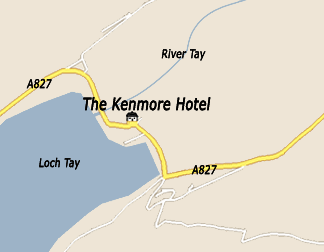 Kenmore is situated in the Perthshire Highlands of Scotland, on the banks of the River Tay and Loch Tay which is close to the geographical centre of Scotland and is the perfect place for a trout fly casting school. 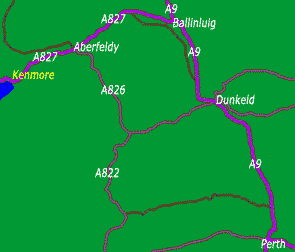 It is 40 miles north of the City of Perth on the A9/A827 route north towards Killin. Driving distance from Edinburgh over the Forth Road Bridge and via motorway to Perth is 85 miles. From Glasgow driving dual carriageway via Stirling to Perth the distance is 105 miles. Bus services operate from Perth, Dunkeld and Pitlochry. Pitlochry also has a main line railway station with regular services and sleeper coaches to/from London and elsewhere in the UK. International airports at Edinburgh, Aberdeen and Glasgow and domestic airports at Inverness and Dundee are within one to two hours driving distance. 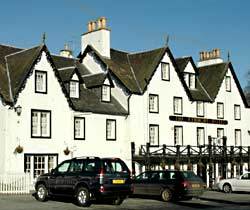 The Kenmore Hotel is the main feature of the village, it is Scotland's oldest inn, established in 1572. Known for its friendly atmosphere, great character, excellent food, long history and as the perfect base for fly fishing and a marvelous venue for "Tackling Trout". Other local attractions include lots of golf courses, walking and cycling in beautiful scenery, water sports, highland safaris, castles, distilleries and not too far away Pitlochry Festival Theatre and the House of Bruar.